North Shore, Oahu - First wave of winter. *This frame is not made from Hawaiian Koa wood. Lynne was born with a keen interest in visual arts and painting at an early age. She grew up on Oahu and became a World Champion surfer winning the titles in 1978 & 1979, but her interest in the arts were never lost. 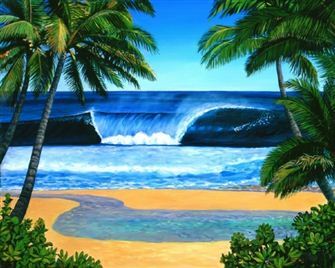 Her lifestyle & love of nature gives her paintings a unique perspective that reflects the beauty and power of the world.